H10 Duque de Loule Boutique Hotel is an exclusive and charming hotel, located in one of central Lisbon's historical buildings. Carefully renovated and decorated by the prestigious interior designer Lázaro Rosa-Violán, it maintains its beautiful façade, a typical example of 18th-century architecture, and its interior design blends traditional Portuguese features with highly modern and functional facilities. 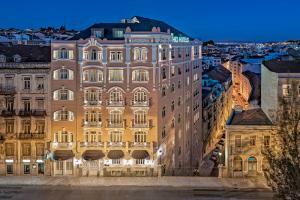 Under 5 miles from the Lisbon airport, in the city center.